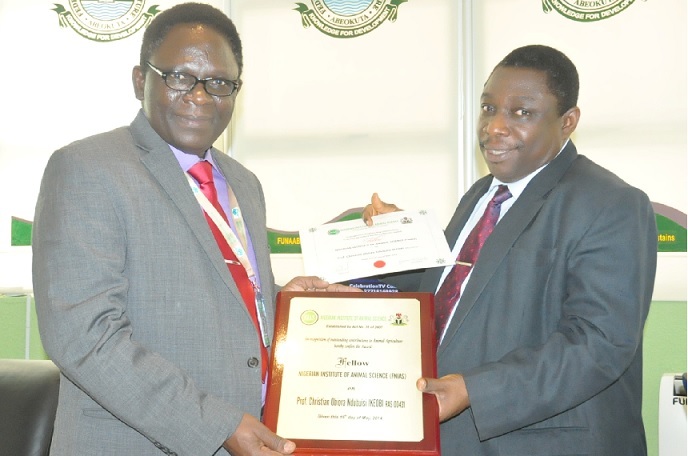 Meanwhile, the Dean, College of Animal Science and Livestock Production (COLANIM) and member, Governing Council of the University, Professor Christian Ikeobi, has revealed that he was humbled by the recent honour bestowed on him by the Nigerian Institute of Animal Science (NIAS). Professor Ikeobi was conferred with the Fellowship of the Institute alongside Professor (Mrs.) Olufunmilayo Adebambo, the Director, Biotechnology Centre. He said the award was in recognition of his professional experience and activities in the Institute. “I have been a member of the institute since 2009 and also a member of the Governing Council since August 2011. I have also been the Chairman of the Mandatory Continuing Professional Education Committee of the Institute for about two years now”, he stated. Professor Ikeobi pointed out that the NIAS had been the vanguard of ensuring food security in Nigeria by enforcing standards in animal production. These include Poultry Production, Animal Feed Production, Animal Processing and other livestock production activities.